Birmingham City failed to score for a fourth time in five home matches as they were frustrated by Blackburn in a goalless draw at St Andrew's. In a game of few chances, it took until the second half for Blues to test Rovers when Demarai Gray shot on target from outside the area. Shane Duffy had Blackburn's best chance as his header after a corner was saved. Jason Steele did superbly to deny Birmingham midfielder David Cotterill late on to secure a point. The draw means Birmingham remain in sixth - the final play-off place - while the visitors stay in 15th. With both teams playing with one striker, defences were on top for the majority of the match. Blackburn's Tom Lawrence had the first half-chance of the match when he bundled through, but his effort flew over. Gray's long-range shot was easily saved by Steele, before Tomasz Kuszczak made an excellent save from Duffy's close-range header. Steele made sure of Rovers' third clean sheet in four games with a diving save to repel Cotterill's powerful strike. "It is a first clean sheet at home this season, which is unbelievable. I told them not to give away the first goal, keep our shape and keep our patience. "I asked them to be tougher defensively. I thought we were a little soft on Wolves and Hull in the previous two games. "I certainly didn't want to lose three games on the spin. That was the reality of the game because runs like that are very damaging to confidence." "They paid us a massive amount of respect with the way they set up getting bodies behind the ball. It was something new for my lads to deal with. "To come to a team who are in the play-offs and perform the way we did was positive. We have now gone six clean sheets in the last 11 games and picked up four points out of six in the last two games on the road." "We had to be disciplined, patient and not get frustrated in not taking three points." Match ends, Birmingham City 0, Blackburn Rovers 0. 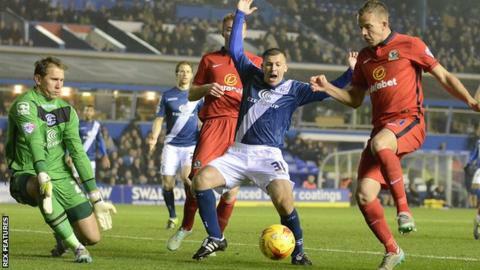 Second Half ends, Birmingham City 0, Blackburn Rovers 0. Attempt missed. David Davis (Birmingham City) left footed shot from outside the box is high and wide to the right. Assisted by Jon-Miquel Toral. Substitution, Birmingham City. Jacques Maghoma replaces David Cotterill. Attempt missed. Paul Caddis (Birmingham City) right footed shot from long range on the right is high and wide to the right. Assisted by David Cotterill. Adam Henley (Blackburn Rovers) is shown the yellow card for a bad foul. Attempt missed. Paul Caddis (Birmingham City) left footed shot from the right side of the box misses to the left. Assisted by David Cotterill following a corner. Corner, Birmingham City. Conceded by Adam Henley. Attempt blocked. Demarai Gray (Birmingham City) right footed shot from outside the box is blocked. Assisted by Jon-Miquel Toral. Attempt saved. Clayton Donaldson (Birmingham City) right footed shot from the centre of the box is saved in the centre of the goal. Assisted by Jon-Miquel Toral. Substitution, Blackburn Rovers. Bangaly-Fodé Koita replaces Tom Lawrence. Attempt missed. Demarai Gray (Birmingham City) left footed shot from outside the box misses to the right. Assisted by Jonathan Spector with a headed pass. Foul by David Cotterill (Birmingham City). Corner, Birmingham City. Conceded by Jason Steele. Substitution, Blackburn Rovers. Adam Henley replaces Chris Taylor. Corner, Birmingham City. Conceded by Grant Hanley. Attempt missed. Jon-Miquel Toral (Birmingham City) header from the centre of the box misses to the left. Assisted by Demarai Gray. Attempt blocked. Jonathan Grounds (Birmingham City) header from the centre of the box is blocked. Assisted by David Cotterill with a cross. Attempt blocked. Jon-Miquel Toral (Birmingham City) right footed shot from the centre of the box is blocked. Assisted by Jonathan Grounds with a headed pass. Ben Marshall (Blackburn Rovers) is shown the yellow card for a bad foul. Demarai Gray (Birmingham City) wins a free kick on the left wing. Substitution, Birmingham City. Jon-Miquel Toral replaces Andrew Shinnie.